If you have a gas oven that’s not firing, don’t be bonehead and automatically assume the valve is bad (hint: it’s usually not). What else could it be? Ah, Grasshoppah, read and learn. You may even see the orange “glow plug” (called a hot surface ignitor) glowing orange and so assume that it’s OK. But you would probably be wrong. Many $$ wrong. You gotsta measure the current drawn by the ignitor before you can say it’s OK or not. The gas valve has a bi-metal that snaps open when a certain amount of current flows through it to heat it up. The ignitor is wired in series with the gas valve. As the ignitor ages, its resistance increases to the point where not enough current is flowing to the gas valve bimetal to open it up. Consequently, the gas valve never opens up. BTW, a common symptom of the early stages of this problem is erratic temperature control in the oven due to delayed firing of the bake burner while cooking. 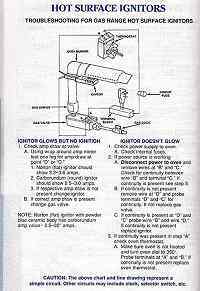 This service sheet illustrates the main players in the ignition system and how to test them. Here’s another picture that shows the main components in a gas oven. The big thing to notice is the difference in current draw between the round and flat ignitors. Look, there’s just no substitute for measuring the current draw–this is the gold standard for diagnosing gas oven ignition problems. I’ll let you in a little secret, though: if the ignitor glows but the oven takes longer than three minutes to fire up then, 97.98745987% of the time, the problem is a bad ignitor. Here’s another tip: if you buy the ignitor through this parts link and that doesn’t fix it, you can return the ignitor for a refund. Who else but the Samurai will make you a deal like that? I’ve talked to lots of shotgun parts-changers about this problem. These are guys who can’t be bothered with the theory of operation. Besides, they already know everything anyway, so they just shoot from the hip and end up replacing a bunch of parts that were still good. They blew beaucoup bucks on a new valve and just can’t understand why the oven still won’t fire up. But now, you know why. This entry was posted in Oven Repair, Range Repair, Stove Repair on September 19, 2004 by Samurai Appliance Repair Man. This information was so very helpful. Our gas oven just stopped firing up one afternoon, and I had just used it that morning! I downloaded the Hot Surface Ignitors service sheet and we determined that the ignitor had to be replaced. I purchased the ignitor, installed it and now the oven works like a charm. We were able to avoid a costly visit from a repair service and we only spent $70 for the part. What about the range ignitors? None of my gas burners will ignite unless I use a match 😉 Thanks. Are you referring to your stove burners? See this page. With the help of this site I was able to repair my sister’s older Hotpoint gas range. Pretty easy diagnosis as the ignitor was not lighting at all. After ohming out the ignitor and getting an open reading and then checking for voltage at the ignitor and getting 120 volts I knew the ignitor was shot. However, accessing those two screws holding the igtinor in place were another matter. After two hours of feeling incompentent, I was able to get to them with a small socket fingertips only. My sister and I were very happy. Thanks for the help. Uh, the link to the repair forum is here. Cool, thanks for the repair story! In the future, when you run into something like that, be sure to come see us in the repair forum where we can get you diagrams and detailed repair procedures specific to your range.